Ron Dermer, Israel’s ambassador to the United States, will speak in New Orleans on Dec. 11. The briefing will be an Israel Bonds event, at the Uptown Jewish Community Center. Doors will open at 6:15 p.m., with the program starting at 7 p.m. There is no charge. 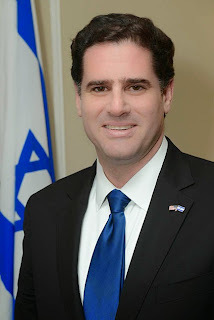 Born and raised in Miami Beach, Fla., Dermer earned a degree in finance and management from the Wharton School of Business at the University of Pennsylvania and a degree in philosophy, politics and economics from Oxford University. For three years, he was a columnist for the Jerusalem Post. In 2004, Dermer co-authored the best-selling book, “The Case For Democracy: The Power of Freedom to Overcome Tyranny and Terror” with Natan Sharansky. The book has been translated into 10 languages. From 2005 to 2008, he served as Israel's Minister of Economic Affairs in the U.S. From 2009 to 2013, he served as senior advisor to Prime Minister Benjamin Netanyahu. The JCC was originally scheduled to host author Tova Mirvis that evening as part of Jewish Culture Month, but her visit will be rescheduled. The Wine and Wonder evening planned by the Jewish Community Day School for Dec. 11 is cancelled. The Latkes with a Twist fundraiser for Jewish Children's Regional Service, starting at 8 p.m. at Bellocq, will go on as planned. The event features Mark Rubin and His Fellow Travelers, a latke bar from Domenica Chef Alon Shaya and a silent auction. Pre-registration with the Israel Bonds regional office in Atlanta and ID are required for Dermer’s talk. The Atlanta office can be reached at (800) 752-5649 or emailing atlanta (at) israelbonds (dot) com.